Renal tumors include benign, malignant, and metastatic tumors. The benign tumors of the kidney are very rare. The most common benign epithelial tumors include papillary adenoma, renal oncocytoma, metanephric adenoma, and metanephric adenofibrom. Papillary adenoma is the most common benign tumor of the tubular epithelium of the kidney. Renal oncocytoma is a benign tumor comprises about 3%–7% of all renal tumors. It usually appears as mahogany brown with a central scar. Metanephric adenoma and adenofibroma are also benign renal tumors which develop both in adults and children., The common mesenchymal tumors include leiomyosarcoma, angiomyolipoma, epithelioid angiomyolipoma, leiomyoma, hemangioma, and lymphangioma. The most common malignant tumor of the adult kidney is renal cell carcinoma (RCC) accounting for 2%–3% of all malignant tumors. It is the 3rd most common malignant tumor of genito urinary system. The incidence rate of RCC vary substantially across the world with a high incidence in Europe and low incidence in Asia. In Europe, the incidence is about 14.5/100,000 for men and 6.9/100,000 for women. In Pakistan, no adequate data is available but a study conducted in Karachi in 2007 shows a frequency of 1.8% of RCC. The average age at the time of diagnosis is around 55–60 years with a male-to-female ratio of about 2:1. The most important predisposing risk factors of renal tumors are hypertension, smoking, obesity, and alcohol consumption. The patients mostly present with symptoms of hematuria, flank pain and/or palpable abdominal mass. In suspected cases of renal tumors, computed tomography is the preferred imaging technique for surgical planning. The tumors with Fuhrman Nuclear Grade (FNG) I and II are considered as low grade while the tumors with FNG III and IV are considered to be high-grade RCC. Low-grade tumors show strong paired box-2 gene (PAX-2) staining while high-grade tumors show weak staining in clear cell and papillary variants of RCCs. Its immuno-expression is also high in metastatic renal neoplasms and is strongly correlated with the proliferation index of the tumor. The expression of PAX genes is important for PAX proteins to function as nuclear transcription factors which is significantly involved in cellular proliferation, differentiation, and migration and therefore, it constitutes the putative targets of disruption during the tumorigenesis. The expression of PAX-2 gene in RCCs has been established but the molecular mechanisms of oncogenic activation of PAX-2 have not been fully understood. Keeping in mind the importance of its role in renal tumors oncogenesis, the present study was carried out to determine the frequency of PAX-2 expression in renal tumors in our setup and to see the association of PAX-2 nuclear staining with Nuclear Grades which is itself a prognostic factor. This study of PAX-2 renal tumor immunomarker will also be helpful to improve the diagnostic accuracy in gray zone cases and suggests a novel therapeutic target for renal tumors in future. This was a descriptive and analytical cross-sectional study. This study was carried out at the Department of Pathology, King Edward Medical University, Lahore in collaboration with other tertiary care hospitals and research centers. Posttreated cases of renal malignancy by radiotherapy and chemotherapy. More than 75% staining in tumor cells nuclei. The PAX-2 expression, PAX-2 nuclear intensity scores and estimated percentage of PAX-2 stained tumor cells were correlated with FNGs. The data entry and analysis was performed using SPSS version 22 software (IBM Corporation). Quantitative variables were presented using mean ± standard deviation. Qualitative data were presented using frequency tables and percentages. PAX-2 expression in different types of renal tumors was presented as frequency and percentages. Chi-square test was used to see the association of FNG with PAX-2 expression. The results were stratified for RCC in relation to PAX-2 expression and FNGs. P ≤ 0.05 was considered to be statistically significant. There were 34 males (56.7%) and 26 females (43.3%) cases in this study. The male to female gender ratio was 1.3:1. The overall mean age was 48.33 ± 16.88 within range of 2–73 years. Out of 60 cases of renal tumors, 27 cases (45%) were of low nuclear grades, whereas 29 cases (48.3%) were of high nuclear grades. Out of 34 cases of clear cell RCC (ccRCC), 20 cases were of low nuclear grades and 14 were of high nuclear grades. There were 15 cases of papillary RCC (pRCC), out of which 5 cases were of low grades and 10 cases were of high grades. Two cases of chromophobe RCC (chRCC) were of low grades. All 5 cases of sarcomatoid variant of RCC were considered to be high-grade tumors by the conventional classification. There were four cases in this study to which FNG was not applicable. These included one case of urothelial carcinoma, two cases of Wilm's tumor both of which were of favorable histology and one case of metanephric adenoma [Table 1]. 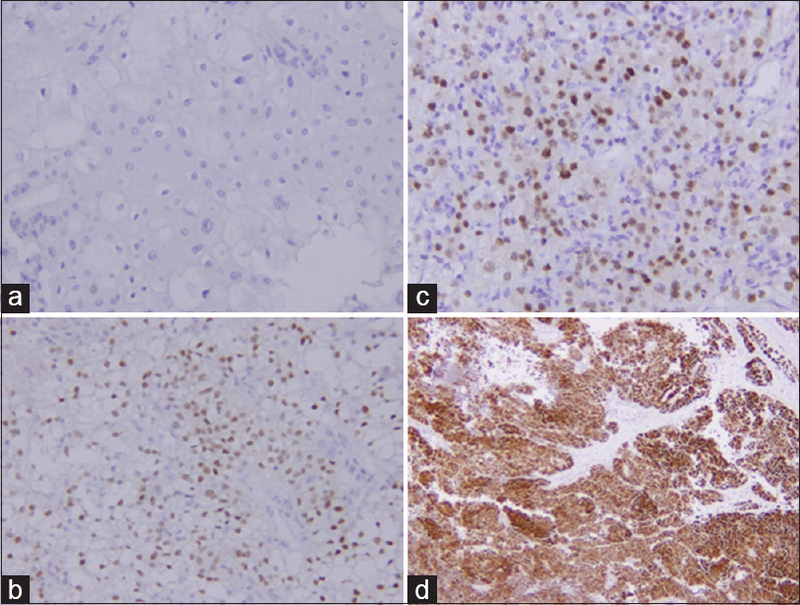 A total of 60 cases of renal tumors on which anti-PAX-2 antibody immunohistochemistry (rabbit monoclonal, ab150391, abcam, UK) was performed after confirming the diagnosis of renal tumors. Forty-five out of 60 cases (75%) showed PAX-2 nuclear immunoexpression. The frequency of positivity in renal tumors was as follows: There were 34 cases of ccRCC of which 29 cases (85.5%) were PAX-2 nuclear immunoreactive. Twelve cases (80%) of pRCC out of 15 cases were PAX-2 positive. One case (20%) of sarcomatoid variant of RCC out of 5 cases was PAX-2 positive. There was one case of metanephric adenoma which was PAX-2 positive (100%). There were 2 cases of Wilm's tumors both of which were PAX-2 positive (100%). Two cases of chRCC and the single case of urothelial carcinoma were PAX-2 negative [Table 2]. The PAX-2 positive cases were evaluated for nuclear staining intensity and 20 cases out of 45 cases were categorized into score 1+, 16/45 cases were categorized into score 2+, and 9/45 cases were categorized into score 3+. There were 27 low FNG tumors out of 60 cases which showed staining score 0, 1+, 2+ and 3+ in 3, 9, 8, and 7 cases, respectively. 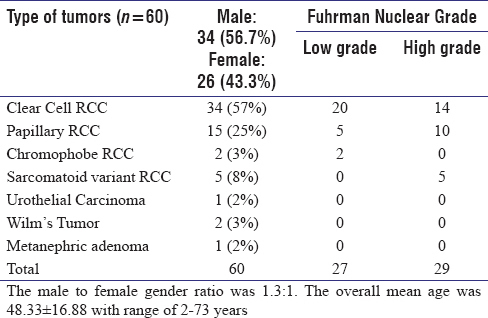 Twenty-nine high Furhman nuclear grades tumors out of 60 cases showed staining scores 0, 1+ and 2+ in 11, 11, and 7 cases, respectively [Table 3] and [Figure 1]. In our study, the age range was 2–73 years and mean age was 48.33 ± 16.88 years. Majority of the renal tumors were seen at the age of 60 years. The tumors were more common in males (34/60; 56.7%) as compared to females (26/60; 43.3%). The ratio of male to female patients was 1.3:1. The variation in mean age and gender ratio  may be due to our small sample size and unicentric study. Our study demonstrated the frequency of lesions arising from different sites and poles of the kidney. Seven tumors were found to arise from the upper pole of kidney, 10 tumors arose from the mid of kidney, 9 tumors arose from the lower pole, 31 tumors showed the whole kidney involvement and 3 tumors showed multiple tumor nodules in the kidney. The results of this study were not consistent with the study of Ordóñez and Rosai  which might be due to the small sample size in our study. In our study, the frequency of PAX-2 immunoreactivity was 85% (29/34) in ccRCC and 80% (12/15) in pRCC. These findings of our study were almost consistent with different studies mentioned in literature. In the study of Memeo et al., PAX-2 expression was detected in 84% of ccRCC and 85% of pRCC. The results of Daniel et al. showed PAX-2 expression in 93.3% of ccRCC and 100% of pRCC. Mazal et al. studied 202 renal tumors and found PAX-2 expression in 88% of ccRCC and 18% of pRCC. In the study of Ozcan et al., PAX-2 expression was 95% in ccRCC and 76% in pRCC. In another study by Sharma et al., the frequency of PAX-2 expression in pRCC was 67%. The results of Gokden et al. showed 61% PAX-2 staining in renal tumor cytopathology. Thus, the frequency of PAX-2 expression in ccRCC and pRCC in our study was consistent with these studies. The percentage of PAX-2 stained tumor cells were also evaluated and <10% stained tumor cells were considered as negative cases according to previous studies., The percentage of stained tumor cells were categorized as 10%–25%, 26%–75% and >75% in positive cases. In our study, the mean of the percentage of stained tumor cells was 33.33% in ccRCC and 50% in pRCC. These results of our study were not consistent with the study of Ozcan et al., which may be due to our small sample size, improper fixation or necrotic cells in the tissues. In our study, the frequency of PAX-2 expression was 48.5% (27/56) in low FNGs and 51.5% (29/56) in high FNGs. In ccRCC, 59% of cases (20/34) were low grade and 41% of cases (14/34) were high grade. In pRCC, 33.3% cases (5/15) were low grade and 66.7% (10/15) were high grade. The lower grade tumors showed strong staining intensity and higher percentage of stained tumor cells as compared to high grades. The results of our study were consistent with studies of Ozcan et al., and Mazal et al. which showed an inverse relation of PAX-2 intensity and staining extent to FNGs. In our study, there were only 2 cases of chRCC because of less frequency of this tumor and both of 2/2 (100%) cases were negative for PAX-2 staining. Both cases were of low nuclear grade tumor. The result of our study was consistent with the study by Patricio et al. Our data about chRCC has some variations with other studies such as Mazal et al. and Memeo et al. Their results of PAX-2 expression in chRCC was 13% and 9%, respectively, as these studies were having larger sample size. If more number of chRCC were included in this study, the PAX-2 positivity might be seen in some cases. In our study, there were 05 cases of sarcomatoid variant of RCC. The frequency of PAX-2 staining was 20% (1/5). There was weak staining and estimated percentage of stained tumor cell was also low (10%–25%). As the name indicates, all cases were high grade tumors. The results of our study were consistent with the studies of Ozcan et al., and Mazal et al. who demonstrated that PAX-2 immunoexpression was weak or absent in all poorly differentiated carcinomas or sarcomatoid component of ccRCC. Metanephric adenoma is a benign lesion which is rare in its frequency. It shows tubular structures lined by small well differentiated cells. There was one case of metanephric adenoma in our study, which showed PAX-2 immunoexpression (1/1; 100%) of moderate intensity. The result of our study was not consistent with results of Ozcan et al. which showed strong and diffuse PAX-2 staining in metanephric adenoma in all cases. The variation may be due to poor fixation. Urothelial carcinoma of the renal pelvis is also a rare variant of kidney tumors. The well differentiated urothelial carcinomas are easily diagnosed, but poorly differentiated carcinomas are difficult to diagnose so in these situations specific immunomarkers are helpful. In our study, one case of urothelial carcinoma of high grade (according to its own grading system of invasiveness  )was included, which showed negative PAX-2 immunostaining. This result of our study was consistent with the study of Ozcan et al. In our study, 2 cases of Wilm's tumors (favorable histology) were included and both of these cases showed 100% (2/2) PAX-2 positivity. The nuclear staining was diffuse, homogeneous and strong in almost all of blastemal and epithelial components. The stromal component positivity was not appreciated. In these cases, cytoplasmic staining was also apparent but was not significant. The results of our study were consistent with the study of Davis et al. which showed 97% PAX-2 staining and it was strong and diffuse in epithelial and blastemal components. So, overall the results of our study were consistent with the studies mentioned above which showed the role of PAX-2 in renal tumorigenesis. Further work needs to be done to evaluate the role of PAX-2 in renal pathogenesis and to consider it a therapeutic target for curative purposes and prevention of renal tumors progression. PAX-2 is a diagnostic immunomarker of renal tumors. It was positive in 75% of the renal tumors in this study. Its frequency was 85% in clear cell RCC, 80% in pRCC and 100% in Wilm's tumor. PAX-2 is strongly associated with FNGs. Its frequency of expression is high in renal tumors and the intensity and percentage of staining is more in well differentiated low grade renal tumors as compared to the poorly differentiated high grade renal tumors. A panel of immunomarkers can be used in which PAX-2 may help to improve the diagnostic yield and differential diagnosis of renal tumors because kidney is of Mullerian origin which shows almost uniform positivity of PAX-2 in most of the renal tumors. Humphrey PA, Serrano MF. Adult renal neoplasms. In: Humphrey PA, Dehner LP, Pfeifer JD, editors. The Washington Manual of Surgical Pathology. 2nd ed. Washington DC: Lippincott Williams & Wilkins; 2012. p. 357-71. Ordóñez NG, Rosai J. Urinary tract: Kidney, renal pelvis, and ureter; bladder. In: Rosai J, editor. Rosai and Ackerman's Surgical Pathology. 10 ed. NY: Mosby Elsevier; 2011. p. 1101-247. Patrício P, Ramalho-Carvalho J, Costa-Pinheiro P, Almeida M, Barros-Silva JD, Vieira J, et al. Deregulation of PAX2 expression in renal cell tumours: Mechanisms and potential use in differential diagnosis. J Cell Mol Med 2013;17:1048-58. Chow WH, Dong LM, Devesa SS. Epidemiology and risk factors for kidney cancer. Nat Rev Urol 2010;7:245-57. Protzel C, Maruschke M, Hakenberg OW. Epidemiology, aetiology, and pathogenesis of renal cell carcinoma. Eur Urol Suppl 2012;11:52-9. Ahmad Z, Azad NS, Yaqoob N, Husain A, Ahsan A, Khan AN, et al. Frequency of primary solid malignant neoplasms in both sexes, as seen in our practice. J Ayub Med Coll Abbottabad 2007;19:53-5. Escudier B, Kataja V, ESMO Guidelines Working Group. Renal cell carcinoma: ESMO clinical recommendations for diagnosis, treatment and follow-up. Ann Oncol 2009;20 Suppl 4:81-2. Ljungberg B, Bensalah K, Canfield S, Dabestani S, Hofmann F, Hora M, et al. EAU guidelines on renal cell carcinoma: 2014 update. Eur Urol 2015;67:913-24. Ozcan A, Zhai J, Hamilton C, Shen SS, Ro JY, Krishnan B, et al. PAX-2 in the diagnosis of primary renal tumors: Immunohistochemical comparison with renal cell carcinoma marker antigen and kidney-specific cadherin. Am J Clin Pathol 2009;131:393-404. Schäfer BW. Emerging roles for PAX transcription factors in cancer biology. Gen Physiol Biophys 1998;17:211-24. Robson EJ, He SJ, Eccles MR. A PANorama of PAX genes in cancer and development. Nat Rev Cancer 2006;6:52-62. Ozcan A, de la Roza G, Ro JY, Shen SS, Truong LD. PAX2 and PAX8 expression in primary and metastatic renal tumors: A comprehensive comparison. Arch Pathol Lab Med 2012;136:1541-51. Memeo L, Jhang J, Assaad AM, McKiernan JM, Murty VV, Hibshoosh H, et al. Immunohistochemical analysis for cytokeratin 7, KIT, and PAX2: Value in the differential diagnosis of chromophobe cell carcinoma. Am J Clin Pathol 2007;127:225-9. Daniel L, Lechevallier E, Giorgi R, Sichez H, Zattara-Cannoni H, Figarella-Branger D, et al. Pax-2 expression in adult renal tumors. Hum Pathol 2001;32:282-7. Mazal PR, Stichenwirth M, Koller A, Blach S, Haitel A, Susani M, et al. Expression of aquaporins and PAX-2 compared to CD10 and cytokeratin 7 in renal neoplasms: A tissue microarray study. Mod Pathol 2005;18:535-40. Sharma SG, Gokden M, McKenney JK, Phan DC, Cox RM, Kelly T, et al. The utility of PAX-2 and renal cell carcinoma marker immunohistochemistry in distinguishing papillary renal cell carcinoma from nonrenal cell neoplasms with papillary features. Appl Immunohistochem Mol Morphol 2010;18:494-8. Gokden N, Kemp SA, Gokden M. The utility of pax-2 as an immunohistochemical marker for renal cell carcinoma in cytopathology. Diagn Cytopathol 2008;36:473-7. Davis JL, Matsumura L, Weeks DA, Troxell ML. PAX2 expression in wilms tumors and other childhood neoplasms. Am J Surg Pathol 2011;35:1186-94.